12.5" RCOS @ ~f/9 (2880 mm fl) 0.643 arcsec / pixel. The Zoomify image scale is 1.08 to 3.17 arcsec / pixel. 11/4/2009 to 11/26/2009 Chino Valley, AZ... with CCDAutoPilot3 & CCDSoft. Click here for the narrow band color mapped images. Click here for an Ha filtered b/w version. eXcalibrator for (b-v) color calibration, using 10 stars from the NOMAD1 database. PixFix32 (pre-beta) to repair hot/cold pixels and column defects. CCDStack to calibrate, register, normalize, data reject, combine the sub exposures & LRGB color combine. PhotoShop for LLRGB combine & on-linear stretching. 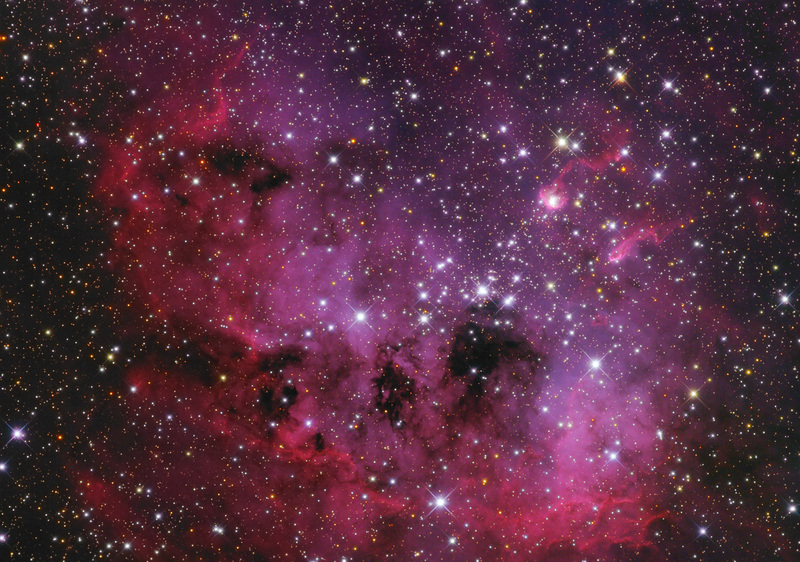 IC 410 is at a distance of about 12,000 light-years, toward the constellation Auriga. The emission nebula surrounds NGC 1893, a young star cluster, which energizes the gas. At the upper right are two interesting objects, about 10 light-years long, that are commonly named "The Tadpoles." Their creation by stellar winds and radiation is most evident in that the Tadpole's tails point directly away from the nebula's central star cluster.